Witch hazels are beautiful, elegant shrubs with fragrant winter flowers. They are usually at their best in January and February regardless of weather, because their delicate flowers are undamaged by frost and snow. However these are not one season wonders; they also have the benefit of superb autumn colour. 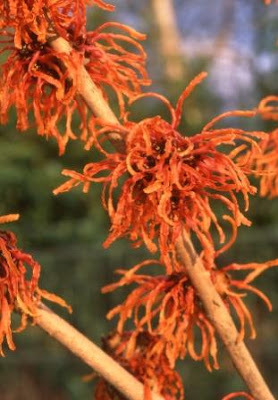 The name witch hazel comes from the North American species Hamamelisvirginiana. Branches of this plant were used by early settlers as water divining rods. As they had the same magic properties as branches of hazel used at home the plant gained the name witch hazel. Hamamelis virginiana is grown as the rootstock upon which our wonderful garden varieties are budded, so whichever one you choose it has magical roots. Witch Hazels are easy to grow on well drained fertile soil. They prefer neutral to acid conditions and are not fond of shallow chalk. Some of the smaller growing varieties can be grown successfully in large containers using lime free John Innes compost. Witch hazels make excellent specimen shrubs and can be grown free-standing in grass. They need space to develop and attain their natural shape and spread; pruning ruins this and should be avoided. Size varies with variety, but on average they reach a height of 2 metres with a spread of 2 metres in 10 years. The best witch hazels are those grown by Hillier Nurseries. They start life in the field, where they develop a robust root system and branch framework, before they are potted and grown on for sale. They are also true to type which is more than can be said for many inexpensive hamamelis offered for sale. 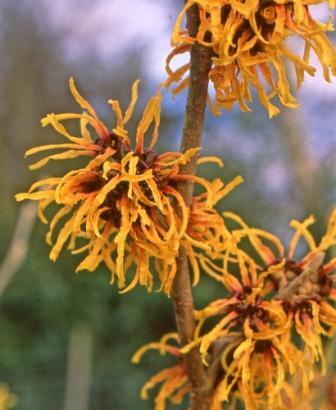 This is the ideal time to buy and plant your Hillier witch hazel as plants are full of buds and you have those delicate winter flowers to look forward to. Also the wet summer has resulted in spectacular growth so the plants are even bigger and stronger than usual. Think about how you position your witch hazel in the garden: Plant yellow flowered varieties against a dark background such as a large evergreen shrub; plant orange and red flowered varieties where the flowers will catch the morning or afternoon sun. Hamamelis mollis ‘Wisley Supreme’: A large shrub, upright habit. Pale yellow sweetly scented flowers. Hamamelis x intermedia ‘Sunburst’: Upright habit. Large, pale yellow flowers with a sweet fragrance. Golden-yellow autumn colour. Hamamelis x intermedia ‘Robert’: A large shrub of vigorous habit. Large yellow flowers suffused with copper-red. Hamamelis x intermedia ‘Orange Beauty’: Broad spreading habit. Large orange yellow flowers produced early in the season. Brilliant orange-yellow autumn colour. Hamamelis mollis ‘Jermyns Gold’: A large shrub of upright habit. Golden-yellow, broad-petalled, sweetly fragrant flowers. Yellow autumn colour. Hamamelis intermedia ‘Harry’: Upright habit. Pale orange flowers in large crowded clusters. pleated leaves. Bright yellow flowers produced late in the season.